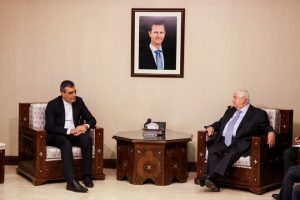 President Bashar al-Assad received on Sunday Iranian Foreign Minister’s Special Assistant for Political Affairs, Hussein Jabri Ansari, and the accompanying delegation. Talks during the meeting dealt with the need to develop a common ground and a clear understanding of the most important outcomes of Sochi Congress, which was agreed upon by the participants, with emphasis laid on the importance of international mediator de Mistura’ commitment to his role as a facilitator for the dialogue only. The repercussions of the Turkish aggression on Afrin and Turkey’s aggressive attitudes toward Syria were also discussed during the meeting. 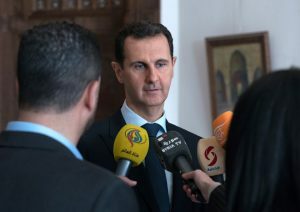 President al-Assad affirmed the importance of prior and permanent coordination between Syria and friendly countries on various issues at this crucial stage, adding that that the Syrian people are the final decision-makers in any future political options related to their country and this decision will not be in the hand of anyone else. The president pointed out that the current Turkish aggression on Afrin is a new proof of Turkey’s continuing policy towards Syria and a further proof that trusting this policy and its sponsors is not possible. Ansari, for his part, asserted his country’s keenness on coordination and consultation with Syria in various fields, adding that any effort exerted by Iran to support the political solution to the crisis in Syria will be in agreement with the Syrian leadership, noting that Syria and its people have special status at the people and government of Iran. The meeting was attended by Presidential Political and Media Adviser Dr. Bouthaina Shaaban and Deputy Foreign and Expatriates Minister Fayssal Mikdad. 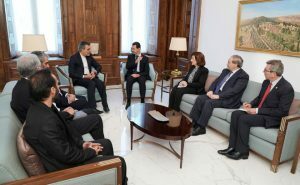 President Bashar al-Assad affirmed that the political and media campaign against Syria, under humanitarian titles, mainly aim at arousing terrorism and terrorists after the successive strikes against them. 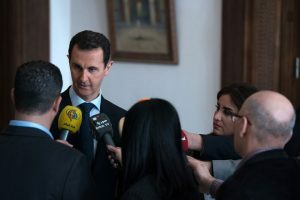 “We meet with Iranian and Russian delegations in order to tackle the current situation, at the same time, in order to continue the outcomes of Sochi congress and during the coming days, there will be a Russian, Iranian and Turkish tripartite meeting to discuss the situation in Syria,” President al-Assad said in a press statement to a number of media outlets. As for the UN Security council resolution No. 2401, President al-Assad affirmed that the Syrian Arab army doesn’t launch aggression to stop the aggression, but the army is returning stability and defending the people, the mentioned resolution came in its first formula in order to protect terrorists in the face of the Syrian army, but when the resolution came in the current formula, which is relatively good, instructions were given to the terrorists to continue shelling Damascus city. “We have not started from Ghouta; we have started since the first day in combating terrorism in every place, we have started in Aleppo, Homs and Deir Ezzor; the operation in Ghouta is a continuation of combating terrorism in different places,” President al-Assad said. As for the UN resolution and humanitarian file, the President added that the talk about humanity in the western logic means one thing, which is translated in Syria, that is; the Syrian Army is advancing. The president wondered what the western coalition is doing every day in Deir Ezzor, Raqqa and Hasaka, daily massacres, in February alone, there were more than four massacres against civilians. On the truce in Eastern Ghouta and the evacuation of civilians, President al-Assad stressed that the majority of citizens in Eastern Ghouta want to get out of the terrorists’ shadow into the lap of the State, so, the operation against terrorism will continue in parallel with opening the way for the civilians to get out into the State’s regions. On the fabrications against the Syrian government of using chemical materials against civilians, the President said that the chemical file has become a term of the western lie idioms; and it is not the first time, I believe that we all heard this idiom for the first time in 2012. “In addition, we abandoned the chemical weapon in 2013 and there is an organization concerned in inquiring this issue, and if there was any evidence, it would announce this thing, so I repeat, it is a mere blackmail which is used as a pretext to direct strikes against the Syrian army, “President al-Assad said. As for the massacres perpetrated by the US-led coalition against civilians in Deir Ezzor and Raqqa, President al-Assad stressed that the western coalition is simply Daesh’s air force, regardless of naming, adding that this coalition supports Jabhat al-Nusra, Daesh and other similar terrorist organizations without any shame. “The entry of popular forces to Afrin is a normal thing; when there is an external aggression, it is natural that the social spectrum unify when the Syrian Arab army is engaged in the fight against terrorists in other places,” President al-Assad said regarding the Turkish regime’s attempts to enter Afrin. In the same context, Deputy Prime Minister, Foreign and Expatriates Minister Walid al-Moallem met Ansari and the accompanying delegation, with the two sides discussing bilateral relations and the importance of working to develop them in various fields, in addition to the latest field and the political developments in Syria and the region and their impacts on the regional and international arenas. The two sides also agreed on bolstering bilateral relations in the coming phase in a way that serves the common interests of both countries and peoples.